Please attend the following program which provides an opportunity to meet our local officials and ask questions. In the wake of the current political events we, as Muslims more than ever , need to be a part of the bigger community, by showing active participation in the broader arena of the society. In our last civic engagement meeting at IFN, Mr. Michael G. Nerheim, the Lake County State Attorney suggested ways of volunteering at his office. We are looking to recruit volunteers for local lake county govt at IFN platform. We encourage our community members especially youngsters to e-mail their interest to Nadia Shah nadiashah1999@gmail.com or Farah Ahmed fahmed9@yahoo.com. One of the initiative is to have better working relationship with local press (both paper/electronic). We are looking for qualified volunteers with background in journalism and electronic media. The desired volunteers will work closely with newly formed press group and EC president to assist in communication between IFN and press (paper/electronic). The goal is to increase awareness of Islamic Foundation North and its activities with local press.Please e-mail your resume to Dr Amin Nadeem (aminnadeem@yahoo.com). 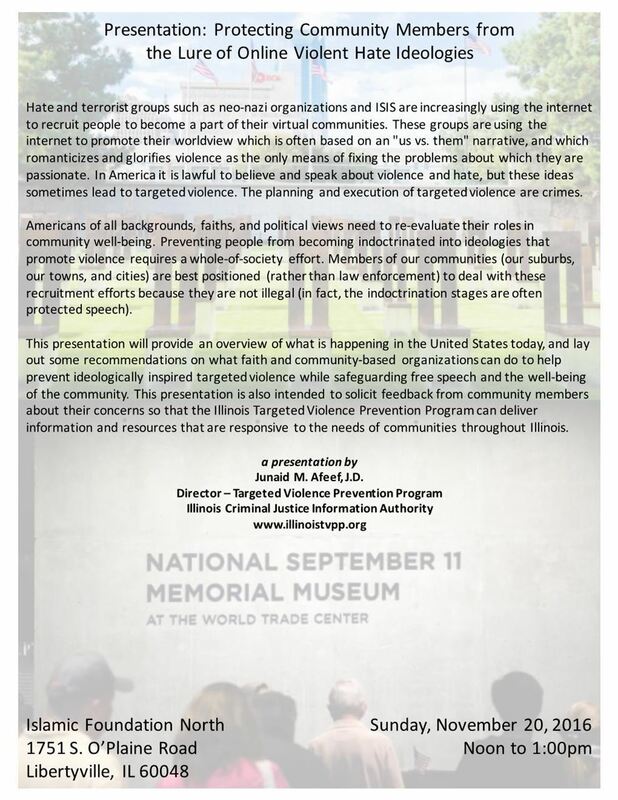 The Islamophobia and civic engagement committee is working closely with national organizations like sound vision.We feel the civic engagement efforts are important both at local and national levels. We feel that our goals are aligned with organizations like sound vision. We would like to invite you to fund raising and current situation awareness dinner for sound vision on Friday, May 12 immediately after Maghreb. Kristina Backer(author of book: From MTV to Mecca-How Islam inspired my life) will be keynote speaker. Imam Abdul Malik Mujahid will provide update on latest efforts of sound vision in struggle against Islamophobia and to enhance civic engagement. 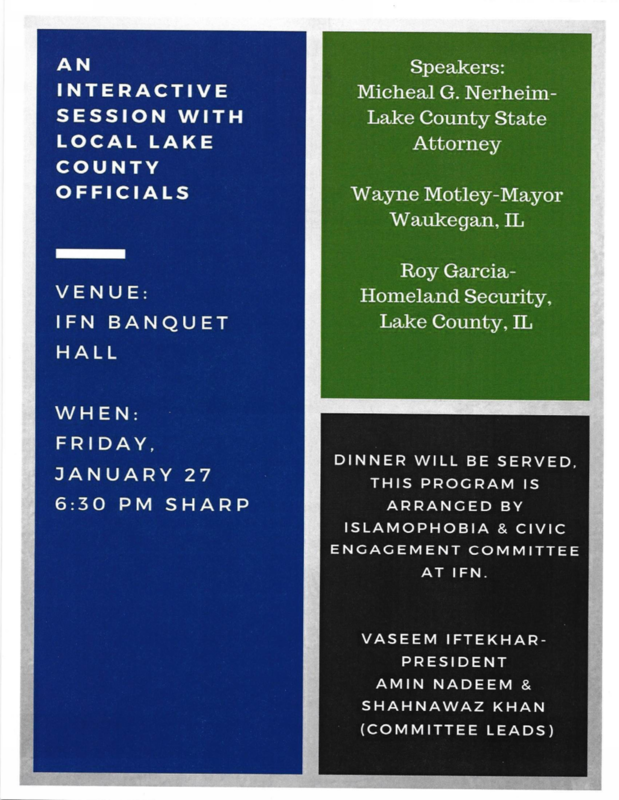 On Friday January 27, 2017 - The Islamic Foundation North (IFN) took the first step to open a dialogue and battle islamophobia by hosting an interactive session with local Lake County officials. The event began with a prayer by Imam Azfar Uddin and continued with welcoming remarks from the current IFN President Mr. Vaseem Iftekhar. Mr. Iftekhar opened the evening by commenting on the urgency of beginning a dialogue in our community. He reminded those present that “this country is based on equality and is a symbol of democracy and fairness”, and continued by sharing that the mosque is an asset to the community. But given the current rhetoric in America “our communities are in turmoil and this is having a negative effect on our Muslim youth”. The evening continued with words from a young IFN female member, Ms. Zareen Abbasi. Ms. Abbasi shared her concerns of being a youth under the current administration. “These are confusing times to be a Muslim in America, confusing times being anything different in America”, she said. Her remarks told the raw truth of having to deal with discrimination and prejudice. She proclaimed that it’s easier to pretend to be something you are not, than to openly show your faith in the current political climate. But putting our heads in the sand will not solve anything, “education and being involved that is the foundation”, she said. “I am a realist,” said Mr. Michael Nerheim, the Lake County State Attorney and he continued by stressing that “I take hate crimes in Illinois very seriously and they will not be tolerated, he then mirrored Ms. Abbasi’s comments “the cure to hate is education”. The two other guest speakers spoke highly of the Lake County Muslim community and shared the importance of serving and protecting. Mr. Roy Garcia Homeland Security, Lake County said, “I took an oath to serve and protect, and I serve you my brothers and sisters”, and Mr. Wayne Motley, Mayor of Waukegan said “your religion is a wonderful religion, and I welcome it with welcoming arms, our community will grow and prosper because of you”. These words were profoundly appreciated and showed respect of our religious beliefs and cultural differences. The evening ended with a Q&A session, IFN members received advice on the steps to take should they face any type of hate crimes. IFN member Mrs. Loubna Kiliouine from Libertyville, said “this was a great first step, our community has never faced such issues in the past, but given the current rhetoric we have no choice but to start such dialogues, its important to have our voices heard”.